Jagannath Temple is one of the most renowned as well as the biggest temples of Orissa. Established in the 12th century, the temple is dedicated to Lord Jagannath (Lord Krishna), Lord of the Universe. The credit for laying the foundation of the Jagannath temple of Puri goes to Raja Ananta Varman Chodaganga Dev. The temple is located at a distance of 60 km from Bhubaneswar, on the coast of Bay of Bengal, and is greatly revered by devotees following the Vaishnava traditions.Constructed in the 11th century and enjoying the honor of being one of the char dhams, the pilgrimage that every Hindu intends to take up, Jagannath Temple is the honor of Puri and Odisha (Orissa). The holy sight of Lord Jagannath, accompanied by Subhadra and Balabhadra invokes joy in their devotees. The two gods and the goddess of the temple are ornamented in accordance with the occasion and seasonal change. The structural design of the temple is reminiscent of a pyramidal structure.There is an interesting legend associated with the Jagannatha temple of Puri. It is said that King Indradyumna, the ruler of the territory, saw Lord Jagannath in his dreams and following the Lords wishes, he sanctioned the Jagannath Puri Temple in that same image. Situated in the heart of the holy city, the temple is visited by devotees from farthest corners of India as well as the world. It exudes splendor and its tall spires lend it a magnificent aura. The walls are embellished with exquisite carvings.The pillars that provide support to the temple are adorned with pictures depicting the life of Lord Krishna. The Puri Jagannath tops the list of majestic monuments in Orissa. One of the most popular attractions of the Jagannatha Temple of Puri is its annual Rath Yatra festival. It is basically a chariot festival, where idols of the Lord Jagannath, Lord Balabhadra and Goddess Subhadra, the main deities of Srimandir, are taken to the Gundicha temple on bejeweled chariots and are brought back to the mandir the same way.Of the many legends associated with the temple, the following is the most prominent. It is believed that in the Krita Yuga, the actual image of the Lord had the power of granting moksha to anyone who laid eyes on it. Yamaraja found this unjust and in a fit, he decided to hide the image in a distant and unknown corner of the earth. However, as Dvapar Yuga arrived, the idol that is worshipped today in Jagannath Puri was constructed by Lord Vishnu with the help of wooden logs. Though the idol lacks hands, it is still believed that it holds immense power. Every 12 years or so, the idols are replaced with exact replicas made of wood from sacred wood. This festival is termed Navakelevara (New Embodiment), and is a very auspicious ceremony; a celebration of the rarest of secrets that the artisans and priests practice to bring life and power to the idol through a complex set of rituals.Each day, the Lord at the Jagannath Temple is offered bhoga six times and it is dispensed among the worshippers close to Ratnavedi. Of the many festivals celebrated here, the temple is most famous for its annual Rath Yatra, or chariot festival, in which the three main temple deities are hauled on huge and elaborately decorated temple cars. It is said that the King who sanctioned the temple, wished to construct a temple similar to Srivatsa Khandasala but surpass it in grandeur by sanctioning Puri at a height of 100 cubits. However, as is described in Madala Panji, he conceded to a temple 90 cubits in height on advice from his council.The temple is sacred to the Vaishnava traditions and Saint Ramananda who was closely associated with the temple. It is also of particular significance to the followers of the Gaudiya Vaishnavism whose founder, Chaitanya Mahaprabhu, was attracted to the deity, Jagannath, and lived in Puri for many years. Puri is one of the seven holiest temples in India. Puri is also one of the four holy dhams of India, the others being Dvaraka, Badarinath and Rameshvaram. It is located 60km from Bhubaneshwar, on the coast of the Bay of Bengal. Puri is called Sri Purushottama Dhama, the abode of the Lord Vishnu on earth. It is the eastern dhama and one of the four Sankaracaryas of lndia stays here. It is believed that, there were 752 Mathas i.e., religious endowments, constituting institutions for the study and propagation of religious creeds in Puri. But now, only about a dozen of them deserve mention.Puri was also one of the places where Chaitanya, one of the saints of the Bhakti movement lived for a time, and Chaitanyas followers regard it with special reverence because of the connection with their leader.The temple complex comprises an area of 10.7 acres and is enclosed by 2 rectangular walls.The outer enclosure is called Meghanada Prachira. The walls are 20ft high. The inner wall is called Kurma bheda. The walls were built during 15th or 16th century.The second great attraction of Puri is the sea beach acclaimed to be one of the best sea beaches of the world. A number of beach complexes have developed on the sea at Puri & nearby. The sea at Puri is shallow and is therefore, highly suitable for sea-bath. But on particular days of the year, care should be taken to avoid a rush against the waves. The nolias (fisherman of the sea) will help in taking bath in the sea.Orissa has Konark as the Surya Kshetra, Puri as the Vishnu kshetra, Bhubaneshwar as the Hara Kshetra and Jaipur as the Parvati Kshetra.Other names of Puri are Sri Kshetra, Nilachala-dhama, Jagannatha-dhama, Yamanika-tirtha, Martya Vaikuntha, Nilagiri, Shankha-kshetra, Dasha-avatara-kshetra and Narasimha-kshetra. As we arrive at the vast open area in front of the Lions Gate (eastern gate), we see a monolithic pillar about 10 meters high. This pillar is known locally as the Aruna Stambha. In Hindu mythology Aruna is the the charioteer of the Sun-god. The famous Konarka temple was designed in the form of a stupendous chariot and this monolithic pillar with a beautifully carved image of Aruna seated atop in the front porch of that temple. When the temple was eventually abandoned and the presiding deity removed, this pillar was removed from Konarka to Puri and fixed in front of the Jagannatha temple where we see it now.Immediately after we get to enter the main gate there is a flight of steps. Locally, they are called Baisi Pahaca, and a veiled mystery surrounds these stairs. It is interesting to note that great reverence is shown to this flight of twenty-two steps. Parents dictate their children to slowly roll down the steps for it is believed that one will experience an unparalleled spiritual bliss in the process. Many devotees also worship the stairs for the spiritual energy it is said to emanate. Past the main entrance and up the flight of stairs, lies the largest kitchen setup anywhere in the world. It is rightly described by many as being able to feed as many as a lakh of people on a couple of hours’ notice. The kitchen follows very traditional methods of food preparation and takes many by surprise with regard to the quality of hygenic food they send out. To the right, we have the Ananda Bajara, as the popular food market is known.The architecture of the temple follows the pattern of many Orissan temples of the classical period. The main shikhara, or tower, rises above the inner sanctum where the deities reside.Subsidiary shikharas rise above ante-halls.The temple complex is surrounded by a wall, on each side of which is a gopura or gate, over which rises a pyramid-shaped roof. Being the largest temple in the state, it has a complex covering several square blocks with dozens of structures including a mammoth kitchen.The main temple structure of this architectural and cultural wonder is 65m (214 feet) high and is built on elevated ground, making it look more imposing. Comprising an area of 10.7 acres, the temple complex is enclosed by two rectangular walls. The outer enclosure is called Meghanada Prachira, 200m (665 ft) by 192m (640 ft). The inner wall is called Kurmabedha, 126m (420 ft) by 95m (315 ft). There are thirty-six traditional communities (Chatisha Niyaga) who render a specific hereditary service to the deities. The temple has as many as 6,000 priests.The temple consists of four structures called (a) the Vimana or Bada Deula (sanctum sanctorum) (b) the Jagamohan or Mukhasala (the porch), (c) the Natamandir (the audience hall) and (d) the Bhogamandap (the hall for residuary offerings) built in a row in an axial alignment in east-west direction. The temple faces the east. The Vimana is constructed in Pancharatha (temple containing five Pagas or segments) Rekha order. Rekha is the name given to a type of temple with a curvilinear spire. Out of the five Pagas or segments, the middle one is known as Raha, the two flanking pagas as Anuraha, and the two corners as Kanika. Like a full-fledged Orissan temple, it has four-fold vertical divisions, i.e. the Pitha (pedestal), the Bada (wall), the Gandi (trunk) and the Mastaka (the head). The Puri temple is built on a gigantic raised platform in the heart of the city. The temple complex is enclosed by a wall about seven meters high, including the height of the platform. The area of this platform covers over 4,20,000 sqft. The wall is pierced by four gates, facing the four cardinal directions. On the east-facing gate, there are stone images of two lions and it is called the Lions Gate (Singhadwara).The north, south and west facing gates are similarly known as the Elephant Gate (Hathidwara), the Horse Gate (Ashwadwara) and the Tiger Gate (Vyaghradwara, also called the Khanja Gate), respectively. The north gate is mainly meant for the God himself, as the wooden idols are removed and returned to the sanctum sanctorum by way of this gate, during the Navakelevara ceremony. The east-facing Lions Gate is the main gate. There are relatively new pyramidal structures, called gopurams, over the four gates. The temple stands on a high pedestal though a major portion of it is buried in the ground. The visible portion shows three mouldings, which are richly carved. Similarly, the Bada is Panchanga type i.e. consisting of five elements known respectively as Pabhaga (foot), lower Jangha (shin), Bandhana(bond), upper Jangha and Baranda. The Pabhaga consists of five usual mouldings and these mouldings are connected with vertical bands in each Paga of the Bada. These five mouldings are known in the architectural texts as Khura, Kumbha, Pata, Kani and Basanta in ascending order. The Khura is shaped like a horse hoof and contains inverted leaf designs with dotted borders. In each Paga it has a Kirita design and figures of royalty. The lower portion of Khura has been decorated with Vanalata designs and other types of scroll work.The Kumbha is designed like pitcher. The Kani is plain, but the Pata and the Basanta are richly carved. The sculpted friezes of the Pata depict procession of various animals: mostly war-animals interjected by processions of foot soldiers, with the general sitting on a palanquin and giving out orders. The Pata also displays a sculptured panel containing episodes from Gopalila of the Bhagavata Purana. The lower Jangha has Khakhra-mundis (miniature temples of Khakhra order) in the Kanika and Anuraha Pagas. The Khakhra-mundis of Kanika Pagas contain seated figures of eight Dikpalas (guardian deities), while those of the Anuraha depict seated Acharyas (teachers). teaching their pupils and disciples. The recesses between the Pagas are occupied by different types of Vidalas (figures of lion-on-elephant and lion with elephant trunk rampant on a warrior). The Bandhana consists of three mouldings joined together at different places by vertical bands decorated with standing figures of Kanyas (maidens). The upper Jangha depicts Pidha-mundis (miniature temples of Pidha order) containing various deities mostly Vaisnavite in character including the ten incarnations of Vishnu. The recesses between the Pagas contain figures of Kanyas in different postures. It is interesting to note that all the sixteen Kanyas in such places are shown in the sixteen postures as prescribed in Silpaprakasa, an architectural text of Odisha. There is a close similarity in the decorative plan between lower and upper Jangha, except in the nature of the Mundis and of the figures in the recesses. The size and decorative programme of the Mundis and the figures of Vidala and Kanyas are almost equal. The Baranda over the upper Jangha is made to ten carved ouldings of almost equal size. The design of the Raha Paga is different. It contains large niches for the Parsva-devatas on different sides.The southern niche contains the Varaha incarnation, the northern niche houses the Trivikrama image and the western niche shows the Nrsimha form of Vishnu. These three images are made of chlorite and are very exquisitely carved. While Varaha holds the Goddess Earth (Bhooma Devi) in his upraised left arm and a club in his right hand, Nrsimha is depicted in a ferocious form. The latter is seen as taking out the entrails of Hiranyakasipu, the demon king, with two of these hands, while his other two hands show his usual attributes. In the image of Trivikrama of Vamana, the God is seen as placing one of His feet set firmly on the ground, while the other stretches upwards. All the three images have trefoil-shaped designs in the background. In front of each of the three images of side deities, small covered halls with a Sikhara (tower) of Pidha order have been constructed, which are called Nisa temples. These structures are plain and sometimes cover the sculptural beauty of the temple. The upper portions of the Parsva-devata niches depict Dopichha lions (lions with one front and two hind portions), Naga-nagi pilasters, Kanyas and one central image on each side, which is difficult to recognize due to existence of the Nisa structure. The Gandi or the body of the temple proper, consists of ten Bhumis or storeys. At the Kanika Paga of each Bhumi, there is a Bhumi Amla connected with six Bhumi Barandis (courses of stone) and Chaitya medallions are seen carved on them at intervals. The Anuraha Paga of each side is filled with three Angasikharas, i.e., miniature Rekha replicas with rich carvings. In the Rah.a Paga, however, there is a large Vajramastaka at the base, which is a usual feature with most of the Odishan temples. Above the Vajramastaka up to the height of the Gandi, rows of Chaitya medallions with intermittent spaces appear with five such medallions in each rowin the frontal Raha Paga (eastern side) there is a bigger Angasikhara at the Sandhisthala (joint of Vimana and Jagamohana) surmounted with a projecting Gajakranta, i.e, lion-on- elephant. Such Gajakrantas also appear on three other sides in the Raha above the Vajramastaka. A smaller projecting lion also appears on each side of the base of the Gandi. The Mastaka consists of the usual elements of Beki (neck), Amalaka (an Indian fruit of the same name a little flattened), Khapuri (skull), Kalasa Uar) and Ayudha (weapon, i.e, Cakra). In the Beki are inserted four figures of Dopichha lions at each corner, while on the front sides there are images of Garuda. There is nothing specific regarding the other elements of Mastaka, except that the weapon is called Nilachakra, the shape of which is peculiar in Odisha as well as its name. The interior of the Vimana is entirely plain. It is called the sanctum sanctorum or Garbhagruha and in the middle of the room is the Ratnasimhasana on which the images of worship have been installed. The throne is about four feet high and there is a path for circumambulating the throne. There is only one door leading to Jagamohan. The temple was plastered with a thick coat of lime sometime in the 16th century A.D. to protect its surface from erosion and weathering. Quoting temple records, Rajendralal Mitra says that the first application of lime plaster was completed during the reign of Prataparudra Deva on both the Vimana and Jagamohana. The Madala Panji records the process as of 1647 A.D. Thereafter successive plasters had been applied in 18th century, following which the temple looked like ‘an ugly mass of stone and plaster’ as observed by A. Sterling. The famous exponent on Indian architecture, James Fergusson, on his failure to find detailed carvings on the body of the temple, assumed that the art of Odisha had been completely lost. This was strongly refuted by Rajendralal Mitra. Once the conservation of the temple was handed over to the Archaeological Survey of India in 1975, removal of the plaster commenced. So far deplastering of the Vimana is almost complete. Deplastering of Jagamohana is yet to be taken up. The Jagamohan or Mukhasala is a Pidha temple, i.e., a structure with a pyramidal roof. It consists of Pidhas or horizontal platforms that are progressively smaller as they go upwards. The Jagamohana seems to have stood on a Pitha or platform like the Vimana, but its traces are not visible owing to later renovations. The Bada is Pancharatha in plan and consists of five elements. But the details of carving on the Mundis or miniature temples and the niches of the Mundis including the images therein cannot be seen due to application of plaster on them. It is also not possible to know the decorative motifs, the sculptural arts, the mouldings in different elements and even the architectural design due to such heavy plastering. But the Gandi is made of thirteen Pidhas arranged in two Potalas or tiers of seven in the lower and six in the upper following the similar sizing pattern as they move upwards. The Kanthi recess in between the Potalas is decorated with Pidha-mundis, pilasters and images of Mandiracharini. In each side and in each of the two Potalas there are miniature Pidha Mastakas surmounted by Udyata lions, the lion in the upper tier being larger than of the lower. The Mastaka consists of the usual elements of Beki, Ghanta, Amla Beki, Amalaka, Kalasa and Ayudha, which is a disc. The roof of Jagamohan stands on four square pillars. It has two gates, one leading to the south and the other to Natamandir. The latter is considered as the main entrance. It is known as Jaya Vijaya gate, but the images of the Dvarapalas. Jaya and Vijaya are conspicuous in their absence. The door frames of both the gates are ornately decorated with different kinds of floral designs and Naga-Nagi figures. Navagraha figures adorn the upper architraves. Figures of Brahma and Siva on the southern gate are more prominent. Scholars are tempted to believe that the Jaya-Vijaya gate (main gate of Jagamohan) was reconstructed at the time of the construction of the present Natamandir. The Bhogamandap (earlier Natamandir), is a Pidha deula with a high pedestal. The pedestal consists of five divisions. But the elements do not conform to the specifications given in the architectural texts of Odisha, though they are richly carved. Rather there is a similarity between this structure and the Natamandir of Konark temple in Odisha. The depiction of Krishna’s entire life story at the top of the pedestal is quite striking. The projections in the Bada portion are not quite prominent, but the profuse ornamentation of Bada adds to the grandeur of the structure. There are figures of Rama Abhiseka, rowing of boats, Jagannatha-Mahishasuramardini-Sivalinga worship, Siva in Tandava dance posture etc., carved on separate chlorite slabs. Besides these, there are several more chlorite figures in different places on the Bada. The Gandi shows a Pidha order with three Potalas.The Potalas consist of five, four and three Pidhas as we count from the bottom. Huge figures of projecting lions appear in each Potala. The Gandi is Pancharatha in plan like that of Jagamohan. The Mastaka is composed of the usual elements, except that a brazen pot is placed on the top of fit. The structure stands on four pillars and the interior is left entirely undecorated in contrast to the exterior decorations. It has a flight of steps to the north. It is believed that a similar flight existed in south side too, but due to construction of the gangway from the kitchen to the Jagamohan, the steps had to be removed at a subsequent period. The present Natamandir appears to be a relatively newer structure standing on sixteen pillars. Rajendralal Mitra believes that it was originally a structure on eight pillars and subsequently it has been expanded with addition of eight more pillars. Its roof is flat consisting of four layers of stone slabs. The hall is presently used for offering of prayers. A monolithic pillar with the image of Garuda at the top stands towards the eastern part of the hall. The interior of the hall is well decorated with different types of stucco images and paintings. Scenes depicting the Kanchi-Kaveri expedition of Jagannath and Balabhadra and the ten incarnations of Vishnu, with an image of Jagannath as the ninth incarnation are more striking. The hall has two main gates, leading towards the north and the south besides two subsidiary openings. Scholars say that the Vimana and the Jagamohan of the temple were originally constructed by Anantavarma Chodaganga Deva and the other two halls were added later. Rajendralal Mitra says that the Bhogamandap was constructed during the Maratha rule of Odisha (18th century) by an architect named Bhaskar Pandit with an expenditure of about 40 lakh rupees over a period of 12 years, with the materials brought from the Sun-temple of Konark. He goes the extent of informing that the entire structure was dismantled at Konark, brought to Puri and reassembled in the present site. But Madala Panji ascribes construction of Bhogamandap to Purusottama Deva. In fact, a standard Odishan temple consists of a Vimana and a Jagamohan. In the words of Dr. Debala Mitra-II Architecturally, the temples resolve themselves into three broad orders, known to local terminology as Rekha, Pidha and Khakhara. In a typical Odisha temple, the first two go almost side by side and form two component parts of one architectural scheme. So in Odisha the sanctum and the porch have almost become synonymous with the Rekha and Pidha temples respectively, although originally these names were meant to denote the particular type of the structure. Odishan architectural texts also recognize such identification as pointed out by N.K. Bose on the basis of some such texts prevalent in Odisha. It has been stated that the Rekha temple is the male and the Bhadra or Pidha, a female and the joint (Sandhisthala) is called Gainthala, a knot tied in the garments of the bride and bridegroom at the time of marriage. Several additions and alterations have been carried out in the temple but the renovations seem to have preserved the essence of the temple. To the original twin structure of the Vimana and Jagamohan, the first addition seems to have been the present Bhogamandap, a little away from the temple and the hall was intended originally as Natamandir, i.e., the hall meant for dance and music. Addition of the hall, presently known as Natamandir was done subsequently by joining the Jagamohan with the present Bhogamandap. Interestingly, the Natamandir is popularly called Jagamohan, because in this hall the devotees assemble to offer prayers to Jagannath and no dance and music are performed at present. It is used as an audience hall, in addition to the original one. It is presumed that at the time of the construction of the present Natamandir, the original Jagamohan underwent a lot of changes (a) the balustrade windows on the south and north were removed, (b) on the north an extra-room (presently Ratna Bhandar, i.e., the store of jewels) was built and (c) the southern window was completely demolished to convert it into a door. Another notable addition is the gangway connecting the kitchen with the Jagamohan via the present Bhogamandap and Natamandir, to facilitate carrying of food offerings for the deities. The gangway entirely covers up the southern side of the Bhogamandap, the original carvings of which are still visible through its southern door. This gangway is stated to have been constructed by Gajapati Harekrusna Deva (1716-1720 A.D.) of Khurda. Besides, a number of subsidiary shrines have been constructed within the premises of the temple over the years and some such shrines and other minor structures partly cover up the northern side of Bhogamandap. Such modifications and additions may also - be seen on both sides of Natamandir and Jagamohan as well, without any planning. Some of the modifications appear to have arisen out of necessity in connection with the performance of certain rituals within the precincts of the temple. The temple is enclosed by two compound walls, thus forming two enclosures, the inner and the outer. The outer compound wall is called Meghanada Prachira, since the sound of the waves of the ocean do not enter the temple premises by penetrating the walls. The inner compound wall is known as Kurma Prachira, named after a tortoise owing to its shape. There are four gates on all four sides in both the walls. The main gate is called the Simha Dvara or the lions gate, because of the two huge statues of lions in front. The outer enclosure consists of the kitchen (south-east), the Ananda Bazar or the market for the Mahaprasada (north-east), and gardens including the Koili Vaikuntha, Niladri Vihara, besides a few essential structures like Snana Vedi and a few subsidiary shrines as well. The inner enclosure is filled with a number of subsidiary Shrines and various other structures utilized in connection with the observance of various rites and festivals. Devotees circumambulate the temple within the inner enclosure and seek 'Darsan' of the minor deities in a prescribed manner, after which they enter the main temple through the northern entrance of the Natamandir. The main temple is a curvilinear temple and crowning the top is the 'Srichakra' (an eight spoked wheel) of Vishnu. Also known as the ‘Nilachakra’, it is made out of Ashtadhatu (alloy of eight) and is considered sacrosanct. This Nilachakra holds a different flag (Patita Pavana) hoisted every day representing something and is considered as sacred as the main deities. The Nila Chakra is distinct from the Sudarsana chakra which has been placed with the deities in the inner sanctorum. Ritual chakra and flags at the top shikhara of Puri temple of Jagannath also related to Sudarsana chakra.The red flag (12 hand or 14 Feet denotes that Jagannath is within the building. The Nila Chakra is a disc with eight Navagunjaras carved on the outer circumference, with all facing the flag post above. It is 3.5 Metres (11 feet and 8 inches) high with a circumference of about 11 metres (36 feet). During the year 2010, the Nila Chakra was repaired and restored by the Archaeological Survey of India. Nila Chakra is the most revered iconic symbol in the Jagannath cult. The Nila Chakra is the only physical object whose markings are used as sacrament and considered sacred in Jagannath worship. It symbolizes protection by Shri Jagannath. In ancient times when untouchables were not allowed inside the temple, they could pray to Patita Pavana. There are numerous smaller temples and shrines within the Temple complex where active worship is regularly conducted. The Vimala Temple (Bimala Temple) is considered one of the most important of the Shaktipeeths marks the spot where the Goddess Sati's feet fell. It is located near Rohini Kund in the temple complex. Until food offered to Jagannath is offered to Goddess Vimala it is not considered Mahaprasad. The temple of Mahalakshmi has an important role in rituals of the main temple. It is said that preparation of naivedya as offering for Jagannath is supervised by Mahalakshmi. The Kanchi Ganesh Temple is dedicated to Uchchhishta Ganapati. Tradition says the King of Kanchipuram (Kanchi) in ancient times gifted the idol, when Gajapati Purushottama Deva married Padmavati, the Kanchi princess. There are other shrines namely Muktimandap, Surya, Sarasvati, Bhuvaneshwari, Narasimha, Rama, Hanuman and Eshaneshwara. There are many Mandapas or Pillared halls on raised platforms within the temple complex meant for religious congregations. The most prominent is the Mukti Mandapa the congregation hall of the holy seat of selected learned Brahmins. Here important decisions regarding conduct of daily worship and festivals are taken. The Dola Mandapa is noteworthy for a beautifully carved stone Torana or arch which is used for constructing a swing for the annual Dolo Yatra festival. During the festival the idol of Dologobinda is placed on the swing. The Snana Bedi is a rectangular stone platform where idols of Jagannath, Balabhadra and Subhadra are placed for ceremonial bathing during the annual Snana Yatra. Jagannath's chariot is a 35 feet square, rising to a height of 45 feet, with 16 wheels, 7 feet in diameter. More than 4000 people drag the chariot. Hundreds of thousands gather from all over the country to witness this festival. The chariot is dragged to the deity's summer abode where the deities are worshipped for a week, and then a re-enactment of the chariot festival, where they are brought back in procession happens. New chariots are made each year. The Narendra in particular is associated with the famous Chandana Yatra of Jagannath. Of the countless festivals celebrated in the Puri Jagannath Temple, each year with gusto, some of the more prominent ones are listed below. This festival takes place in the month of Vaisaksha and continues for 42 days. But, generaly speaking, for the pilgrims and visitors, it is a festival of 21 days only. The first period is known as Bahar Chandan. During this period, the idols of Rama, Krishna, Madanmohan, Laxmi and Biswadhatri at taken in a grand procession to the Narendra tank. Also images of Siva from 5 surrounding Shiva Temples, known as Pancha Pandavas, accompany them in the procession to the Narendra tank. Every evening, the idols are set afloat in well decorated boats in the tank. The next 21 days, known as Bhitar Chandana, are celebrated inside the Temple. Though there are many rituals performed in this time, they are not as fun and playful as the days of Bahar Chandana. Hence the Bhitar Chandana is not as popular. Of all the festivals celebrated at Puri, the Rath Yatra is the most auspicious and popular. It marks the end of a long series of smaller celebrations that many flock to see during the hot summer and cool monsoon months. The Rath Yatra is a chariot festival where the Lord and his posse are paraded through the streets of the Holy City on exquisite works of craftsmen. The chariots are constructed from the auspicious day of Akshaya Thrithiya and take many days to make. The careful skill and creativity of the craftsmen are evident in the finished products which are used in the weeklong ceremonial journey to the Gundicha temple. The deities, Lord Jagannath, Balabhadra and Subhadra are dressed in all their finery on this long extended journey. On the second day of the bright fortnight of the month of Ashadha, the three deities are brought out of the temple in a procession called pahandi. The deities, colossal wooden statues, adorned with giant floral crowns, called Tahias, are literally pulled, pushed and dragged in rhythmic movement to the accompanying sounds of cymbals, drums and frenzied, devotional chanting. Once the deities are seated in their respective chariots, the Chhera Pamhara (ritualistic sweeping of the chariots with a golden broom) begins. The honor of performing this ritual goes to the Gajapati King of Puri, the Adya sevaka of Lord Jagannath (foremost servant of God). The King comes from his palace on a richly decorated palanquin. Chhera Pamhara is symbolic rite which reinforces that the King, like others, is but a humble servant of the real sovereign, Lord Jagannath. The most exciting part of the Rath Yatra is the pulling of chariots by thousands of people who lay their hands on the sturdy ropes and drag the massive structures along the Bada-Danda (the grand road). The Chariot of Balabhadra moves first, followed by those of Subhadra and Jagannath. The chariots grind forward slowly until they reach the Gundicha temple where the three detities rest for a night on their own chariots, adorned with the Dasavatara costumes. They enter the Gundicha temple on the next day in the usual Pahandi style and stay there for seven days. During the festival, a surprising tradition is also followed. Devotees are privy to the legendary tale of Goddess Laxmi, who is angry for being left out at the temple, in action. In a live depiction of her jealousy, an idol of Her is taken in procession to the Gundicha temple to meet her Lord on the Hera Panchami day (the fifth day from the start of the Ratha Yatra). After a quick peek at her Lord, she returns to the temple, but not before damaging a part of Lord Jagannath's chariot in anger and disgust. The deities, after a seven-day stay at Gundicha temple, their garden house, commence their return journey, the Bahuda Yatra, On the tenth day of bright fortnight of Ashadha. The chariots return in the same order as the onward journey. On his way back, Jagannath stops for a while at the Ardhasini temple, popularly called Mausi Ma temple (Temple of the Aunt). He accepts His favourite rice cake, Poda Pitha, from His aunt as a quick snack. The three chariots then continue on their return journey, pulled by thousands of devotees. The procession reaches Simhadwara in the late afternoon of the Bahuda day and the deities remain seated on their chariots so that devotees are blessed with the vision of the Lord. On the next day, known as Bada Ekadasi, the deities are attired in costumes, adorned in gold, and worshipped by thousands of devotees. This appearance of the deities is known as the famous Suna Vesa. On the Dwadasi day, the three deities return to their original podium, the Ratnasimhasana (jewelled platform), with the usual fanfare and the Pahandi procession. Their arrival into the sanctum sanctorum marks the end of the Ratha Yatra. The three Chariots of Balabhadra, Subhadra and Jagannath are constructed annually by a team of carpenters, who have historically held the rights for this artisanal practice. The chariots are made of Sandalwood, customarily brought from the ex-princely State of Dasapalla. Carpenters who excel in woodcarving still produce these chariots for the car festival, and also carve ornate images of deities upon them. While on the other hand applique work can be seen during processions of the deities in their various ritual outings. Items like Chhati, Tarasa and Chandua are used for the purpose. However, the applique work in its colourful best is most prominent in the cloth cover of the three chariots of the presiding deities in which they travel every year during the Ratha yatra. Lord Jagannth's Chariot is called Nandighosha. It is forty-five feet square at the wheel level. It has sixteen wheels, each seven feet in diameter, and is covered with red and yellow cloth. The Chariot of Lord Balabhadra, called the Taladhwaja, has fourteen wheels, each seven feet in diameter, and is covered with red and blue cloth. Its stands at forty-four feet in height. The Chariot of Subhadra, known as Darpadalan is forty-three feet high with twelve wheels, each seven feet in diameter. This Chariot is covered in red and black cloth. The basic design of the cloth coverings of all three chariots is a similar combination of narrow and wide stripes, while on the four sides above the openings there are mythical motifs of Rahu, Chandra as well as motifs from nature like flowers, etc. It is these colourful applique covers which indentify the chariots of the three deities from far away by the millions of pilgrims thronging the Badadanda or the extrawide main road of Puri in which the lords make their annual sojourn in the car festival. Around each of the Chariots are nine Parsvadevatas, the guardian deities and four horses. Each chariot has a Charioteer called Sarathi. Matali, Daruka and Arjuna are the three charioteers attached respectively to the three Chariots of Jagannath, Balabhadra and Subhadra. Seats and pillows in applique are also made for ceremonial use by the deities during the annual ritual of bathing festival (Snana Jatra) and is locally known as ‘Chakada Kama' with motifs of 27 stars and geometrical forms in applique work with motifs of fish, frog etc. on black cloth is used in the ritual dress of the Deities of Puri temple, locally known as the ‘Gaja Uddharana Vesha', incarnation of Rescuer of Elephant. Applique cover is also made for capparisoning the dummy horses in the ‘Horse Dance' or Ghoda Nacha during Chaitra Festival in Puri and other places. This Festival takes place on the full-moon day of the month of Jyestha (May-June). It is popularly known as the Deba Snana Purnima. This is the first occasion in the course of a year when the deities; Jagannath, Balabhadra, Subhadra along with Sudarshan and Madanmohan are brought out from the Temple and taken in procession to Snana Bedi located in the North-Eastern corner of the outer compound. The deities are bathed with 108 pitchers of water drawn from a well near the Northen Gate. Once the bathing ritual is complete, Jagannath and Balabhadra are dressed like Lord Ganesh as described in the puranas, with the head of an elephant. At the end of the Snana Yatra day, the holy triad, supposedly afflicted with fever, do not return to their pedestal in the sanctum. They stay away from the public view for a period of fifteen days, called Anasara, after which they appear in their Navayauvana Vesha, literally a renewed youth, on the new moon day of the Month of Ashadha. During this fortnight the icons get a fresh coat of painting which gets washed out on the day of the Bathing Festival. During this period the Sevakas, temple servants, also symbolically convalesce with the deities and eat only fruits and other restricted diet. Cloth paintings, representing the deities called Anasara Pati, are displayed over the door hiding the deities from the devotees’ view. This is also known as the Hari Sayan Ekaadasee. This takes place in the month of Ashaadha, after the completion of ‘Return-Ceremony' of the Lords, from the Gundhichaa Ghar. On this occasion, the images of the Vasudeva, Bhubaneswaree, and Narayana are taken in a procession to the Chariots. After some temple rites are performed there, these images are taken to the ‘chamber of slumber' for enjoying complete rest. This takes place on the famous day of Karkata Sankraanti. Special rites are performed on this occasion. This falls in the month of Chaitra. On this day, the deities pay a visit to the garden of the celebrated Jagannath Vallabha Matha where they pick-up the tender leaves of the Dayanaa unnoticed by anybody. This falls in the month of Pausha. The deities are specially dressed on this occasion. Boiled rice mixed with candy and fruit juice are offered to the deities. This festival has agricultural significance. This falls on the full moon day of the month of Pausha. Paarshwa Parivartana Ekadashee takes place in the month of Bhadrapada. Special rites are performed on this occasion. Deva Utthapana Ekadashee takes place on the 11th day of the bright-fortnight of the month of Kartika. It is a very sacred day for the Hindus and special rites are performed in the Temple that day. Pravarana Shashthee takes place in the month of Margashirsha. This is locally known as Odhana Shashthee and special rites are performed in the temple. This is Celebrated from the tenth day of the bright fortnight of Falguna up to the full moon day. The representative deities Dologobinda, Bhudevi and Sreedevi are taken in a procession to Dolabedi located outside the outer compound wall of the main Temple and special rites are performed. The Deities are adorned with cotton and silk fabrics, Gold Ornaments studded with precious stones, flowers of different varieties, Tulsi leaves, sandal paste, camphor. These articles are used in the daily and periodical rituals. The word 'Vesa' (in Sanskrit as also in Oriya) means, dress. Almost all temples dress the primary deity on festive occasions to mirror other well known incarnations of the Lord. Similarly, this tradition is followed in the Puri Jagannath Temple. There are Sevayats dedicated to this particular of the Lord and they are well versed in the draping, dressing and adorning traditions followed in the temple. Besides clothing and jewelry, ample amounts of flowers, tender leaves, sandal wood paste, musk, camphor etc. are also used. Out of the several dresses, a few are mentioned below. The sevaks of temple who dress the deities with clothing and flowers are known as Puspalaks or Singharis. This Vesha is done everyday after Mangal Aarati for the Abakash rituals. The clothes which are worn by the deities for this purpose are known as Tadapa and Uttariya. This Vesha refers to the normal attire of deities which they wear five times a day, especially after each food offering. This Vesha comprises silken clothes and flower garlands. This the last Vesha of the deities done everyday before the night Pahuda. Bada Sringar Vesha consists mostly of flowers of different colours and species. The deities wear silk clothes called 'Khandua'. This vesha is done for 42 days starting from Akshayya Tritiya day and scented, sandalwood paste is applied to the deities. On the full moon day in the month of Jyestha, after the bathing ceremony is over, the deities are dressed like elephants. Lord Jagannath and Lord Balabhadra appear like Ganesh (the Elephant God). On the 11th day in the bright fortnight of Ashada, the Gods are displayed in Suna Vesha, when the deities are in their respective chariots near the Lion's gate of Sree Jagannath temple. The deities are decorated with many gold ornaments. This vesha is also known as 'Bada Tadhau' vesha and Raja Vesha is also done on Dashahara, Kartik Purnima, Pousha purnima and Dola purnima. On the 11th day of the dark fortnight of Bhadraba, Lord Jagannath is dressed as Lord Krishna slaying the Kaliya Serpent, the venomous viper that troubled the inhabitants of the village of Vrindavan, by laying on the banks of the river Yamuna. The scene where the Lord slays the serpent is dramatized in the temple tank of Markanda. It is done on the 12th day of the dark fortnight of Bhadraba (September), Lord Balabhadra's killing of the demon Pralambasura is depicted in this Vesha. On the 12th day of the bright fortnight of Bhadraba, Lord Jagannath is dressed like Vamana (dwarf). Vamana is the fifth incarnation of Lord Vishnu and he defeated the oppressor, King Bali, by outwitting him and sending him down to the raging inferno by pushing him down with His foot. From the 11th day of the bright fortnight of Ashwina to the 10th day of the bright fortnight of Kartika, this vesha takes place. It is the depiction of the union of Radha and Krishna, who are just two parts of a whole. Immediately after the day of Snana Purnima the deities remain unseen for 15 days. Thereafter, on the eve of Ratha Yatra they are gorgeously dressed and pay darsan to the visitors. They put on very charming robes and look like persons at the commencement of their youth. (Nava Youvana). The word 'Chita' literally means the decoration of the forehead with special materials like sandal paste, musk and gorachana etc. But in Puri three magnificient chitas (ornaments of the forehead) made of gold, diamond, saphire and emerald are put on the the three principal deities on the Amavasya day of Sravana. Connected with this, is the decoration of Rahu Rekha. It is an ornament of the head. This is removed from the head of the deities on the day of Snana Purnima and is again put in the month of Sravana. This vesha is occasionally done in the month of Kartika, when there are six days of Panchaka. The lords are dressed like warriors. This Vesha is very rare and has only been seen 5 times, the last time being in 1994. During the period between the 6th day of the bright fortnight of Margasira and the 5th day of the bright fortnight of Magha (Basanta Panchami), the deities wear winter clothes. This Vesha keeps the deities warm and feeling benevolent. Since Jagannatha has been identified with Krisna, incidents connected with the life of the latter have been inseparably associated with Jagannatha. Krisna used to go to the forests with his companions, who were decorating him with the tendrils of the creepers, flowers and tender leaves of different colours. Keeping this incident in view, Jagannatha is dressed in the month of Bhadra in the befitting manner. This vesha is done on any saturday or Wednesday between the new moon day of Magha and Basanta Panchami. Padma means lotus, hence, the dress is made of lotus, Sola (corn) lace, paper, gum etc. This Vesha is done on the full moon day of Magha. There is a story in the Puranas that once, a pious elephant was attacked by a ferocious alligator. In his pain, he implored to Vishnu to save him. His prayers immediately moved Vishnu who immediately hurled his disc to sever the alligator’s head. Jagannatha, who is identified with Visnu, wears this Bhesa to inspire a sense of devotion to the grace of the God. The word Raj a means a 'king'. Hence this Bhesa denotes the dress of a sovereign king. Jagannatha was regarded as the king of Odisha since the rule of Ganga dynasty and this Bhesa of Jagannatha is depicted at least four times a year. Once the Radha-Dhamodara Vesha is done, we have the Harihara Bhesa of Balabhadra. In this Bhesa, half of Balabhadra looks blackish while the other half looks whitish, which depicts that one half of his body is Visnu and the other half is Siva. Jagannatha puts on this Bhesa in the month of Margasira for three days. Sraddha refers to offerings made out of love and hence, such rites as are observed for departed parents and forefathers. In the month of Margasira, Jagannatha performs the Sraddha in favour of Nanda, Vasudeva and Dasaratha. We know that Vishnu was born as the eldest son of Dasaratha, the King of Ayodhya and was named Ramachandra. His next birth took place in a prison in Mathura, as the son of Vasudeva from where he was mysteriously taken out and delivered to Nanda (the king of Braja). Nanda raised him as his own son and came to be known popularly as a second father to Krishna. In the month of Phalguna, according to a social custom prevailing all over India, people play with coloured powder, throwing it at friends and relatives. Jagannatha is the best representative of the people and he is also shown as sharing the experiences of the people by playing with the red powder. 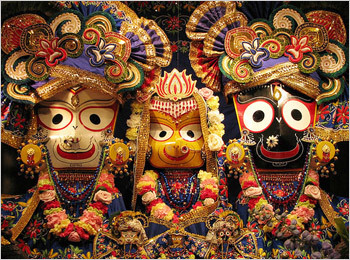 The deities of the Puri Jagannath Temple, comprise a trinity and hence are known as Trimurti. Many believe that then are actually 4 deities. However, another school of thought believes that there were only two idols originally as evidenced by many historical representations. Unfortunately, neither school has any hard evidence to prove their case. Scholars who believe that there were only two idols initially, cite a particular temple in the Cuttack District in Orissa where replicas of only Jagannath and Balabhadra are seen. These are believed to have been carved around 7th century AD and created as an exact representation of the Puri Jagannath Temple. These scholars claim that the idol of Subhadra was only installed later during the rise of Saktism or during Sankaracharya’s visit to the temple. Another representation that many scholars cite is that of a panel in the Konarka Temple where Jagannath, Subhadra (aka Sakti) and a Linga are seen. This bolsters the belief that the beliefs of Saivism, Vaishnavism and Saktism were equally important around the 13th Century. The Puranic texts mention that the original images of Puri consisted of Laksmi and Visnu known as Purusottama. a twin figure. Some literary works, bear testimony to this view too.This is culturally quite distinct from that of the Vedic Aryans. This leads is to believe that the Aryans migrated to Orissa at a later stage and the Vedic religion and only then did this specific culture along with the Upanisadic philosophy and Smarta rituals begin to spread in India. Buddhism had better times during the rule of the Mauryan emperor Asoka, who conquered Kalinga (the coastal region of Orissa as known by that time) after a dreadful war in the 3rd century B.C. It is said that after the conquest of Kalinga, Asoka abandoned violence, embraced Buddhism and left no stone unturned to propagate it. Throughout India including the newly conquered Kalinga, Buddhism continued to be popular for several centuries before Sankaracarya visited Puri in the 9th century A.D. Jainism was perhaps at the height of its glory when Kharavela espoused its cause and took all steps to propagate it in the 2nd century B.C. It is therefore historically reasonable to hold that the cult and culture of Jagannatha found its origin in the primitive system of worship of the non-Aryan tribals who had established a shrine for Jagannatha here, in this part of the country in a very ancient time, with all their religious fervour. The Aryans must then have taken it over to worship Jagannatha according to Vedic rites and rituals with all religious practices connected to them. Buddhism and Jainism must have penetrated in to the innermost apartments of the shrine of Jagannatha with all their religious and spiritual implications. But it has not been possible till now to speak with an air of authority, as to which of the rites; rituals and details of the day-to-day service (Vidhis) of Lord Jagannatha owe their origin either to Jainism or to Buddhism. When we think of the Puri temple, we also think of the presiding deities therein as well as the pattern of cultural life that is in vogue around it, which inspire the pilgrims with the lofty ideal of emotional integration in the country. Hence the cult of Jagannatha as we call it now (by way of translating the words Jagannatha Dharma) has to be understood, interpreted and appreciated with all its social, cultural, religious and spiritual implications. Thus, the glory and greatness of Jagannathism may be brought out in the following manner. At a time when Jagannatha gained immense popularity all important religious cults and creeds known to the people of India in those days were assimilated into the texture of Jagannathism. Such a board-based system of religious life is not to be found anywhere in the world. Lord Jagannath is the Purushottama as per the scripture, Skanda Purana. According to the ancient text, in order to teach human beings how to lead a life full of virtue, He has taken the form of Saguna Brahman or Darubrahman. The most noteworthy aspect is still in the month of Margashirsha, on three consecutive days during amavasya he does Shraddha to his parents (Kashyapa-Aditi, Dasharatha-Kaushalya, Vasudeva-Devaki, Nanda-Yashoda), along with the king Indradyumna and queen Gundicha. As a master he enjoys every comfort daily and in various festivals. He grants all wishes to his subjects, and those who surrender before him he takes the utmost care of. The first physical records of the temple are from around the second century B.C. An inscription atop the Udayagiri Hills speaks of ‘Jinasana’, from the time of Kharavela’s Kalinga Empire. This Hatigumpha inscription is believed to refer to a Jain God but some maintain that it is a reference to Lord Jagannath at Puri. The first reliable record of Puri Jagannath is from the time of Sankaraacharya, when he installed the Govinda Mutt and declared Puri to be one of the Char Dhams. The Char Dhams are temples located along the four cardinal axes and a pilgrimage to them all is considered the highest form of worship. 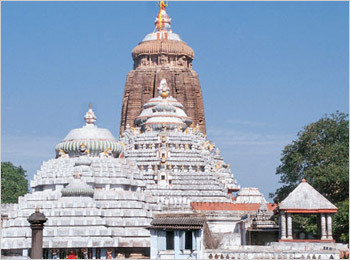 Of them, Puri is the fourth dham located in Eastern India. The records maintained by the Pandas in the Puri temple contain reliable materials to show that for centuries past, people from the whole of India have been visiting Puri in course of their pilgrimage. Pilgrims are generally advised by the Pandas to visit and offer worship in all the surrounding temples before they are taken to the Jaganmohana or the porch to see the presiding deities in the sanctum sanctorum. Within the sanctum, along with Jagannatha, Balabhadra, and Subhadra, the idol of Sudarsan the fourth important divine manifestation, is also worshipped within the sanctum. The four together are known as the Caturdha murti or the four-fold divine images. The idols of Madhava, Sridevi and Bhudevi are also installed in the sanctum sanctorum. Some records claim the temple was originally built by the Kalinga ruler Anantavarman Chodaganga (1078 - 1148 CE). Much of the present structure was built by King Ananga Bhima Deva in the year 1174 CE. It took 14 years to complete and was consecrated in 1198 CE. It is believed that the image of Jagannath was buried thrice in the Chilka lake for protection from invaders. Puri represents one of the four peethas established by Sankaracharya, the other four being Sringeri in south India, Dwarka in Saurashtra, and Badrinath in the Himalayas. Ramananda of the 14th century - a follower of the Sri Vaishnava religious leader Ramanuja, is also associated with this temple. Chaitanya of the 15th - 16th centuries popularized the worship of Jagannath. The vimana or temple spire is visible from the sea, and sailors called it the White Pagoda, to distinguish it from the Black Pagoda - the famous Konark Temple, 32 kilometers down the coast. The priests at the Jagannath Temple are renowned for their physical prowess and exercised daily in the famous religious gymnasium (jagadhara). The pandits were accomplished and respected wrestlers. Puri was already an ancient religious site before the Jagannath Temple was constructed. It was a Buddhist shrine in the fifth century BC, and the Jagannath temple may stand on the site of a temple which contained one of Buddha's teeth. Puri continued to be a holy place with the re-emergence of Hinduism in the fifth century AD; even after a thousand years of Buddhism, the ancient traditions of Jagannath, were remembered and revived. The town contains ancient monastic houses, which can trace their existence back to the eighth century AD. The legend of the revival has striking echoes of the rediscovery of sacred relics elsewhere. The king of Orissa enquired of the local scholars and priests where he might find Jagannath, 'lord of the kings of Orissa', and was told that the images from Puri had been taken to a village in western Orissa. After some difficulty, he found the images (of Jagannath and his two companions Balbhadra and Subhadra), but they were so worn with age that he decided to renew them. However, the priests who alone could carry out the task had also fled, and were only found after a further search. Hindu priesthood was, and still is, hereditary, and it was therefore essential that the right men were found. The priests were re-established at Puri and the new images were installed. The temple was unusual in its political importance: patronage of the temple by the kings of Orissa was a consistent feature of its history, and even the Muslims, who were generally hostile to Hindu shrines because they were a focus for political opposition, reinstated the pilgrimage in 1735 after a long period of anarchy, largely because the taxes from pilgrims were so lucrative. When the East India Company's troops under Lt. Col. Campbell conquered Orissa in 1803, strict instructions were given that the temple should not be harmed, and that the Brahmans there were to be put under the army's protection to ensure their safety. The best time to visit Puri may be from November to February, when Puri’s appeal is on its peak due to the superb weather in these months according to the Indian geography. However, Puri faces huge crowed of tourists during the peak season, which can be avoided by visiting the place in the months of June and July. And this is the very time when you can have glimpse of the famous Chariot festival of Puri, one of the four most celebrated religious centers of India. To avoid the sticky weather of the rainy season during you tour, one is recommended not to visit Puri in the period of June to September. Moreover, it is suggestible not to visit the beach destinations in the monsoon months since the sea water gets fierce due to the persistence of extreme humidity during this period. Puri’s summers are hot with its maximum temperature at 36 Degree Celsius, minimum temperature at 27 Degree Celsius. The city’s winters are cold with Maximum Temperature at 25 Degree Celsius and Minimum Temperature at 15 Degree Celsius. The origin of the English word Juggernaut is from the massive chariots that are drawn at Jagannath Temple. State Capital Bhubaneswar is the nearest Airport otherwise known as "Biju Pattnaik Airport". The distance is 65 km from Puri and can be covered in an hour by car. Indian Airlines operates flights from Delhi, Calcutta, Visakhapatna, Hyderabad, Raipur, Mumbai and Chennai. Puri is well connected by railways. Trains can be boarded from Kolkata (Howrah junction), New Delhi, Ahmedabad, etc. It is also a major railhead on the East Coast Railway, bifurcated from Khurda Road Jn. The Railway Station of Puri is in the heart of the town and near most hotels. If people arrive by train they should go to the Odishan State Tourist counter at the station for advice, they are usually very helpful and speak English. The MCO Booth is also quite helpful. Locals speak Odiya. Due to the presence of people from various parts of India there would not be a language problem. Hindi is also widely used. Some locals even speak Bengali. Only 60 Kms. away from Bhubaneswar by State Highway No-8, Puri has a 35 Km Marine drive road way to Konark.The State Capital is situated on both sides of Calcutta-Madras National Highway No-5.